Elaion, from the greek, ἔλαιον, olive oil. That’s the name we called our farm house, represented by the associates, as well engaged, as well partners for long, Claudio and Alessandra. That’s the same name of a place where our love story born and, when our adventure in Umbria started, booking an olive grove and its ancient farm house and we were looking for naming our business, we searched for the history and origin of the olive tree and we got “Elaion”. Elaion represents the main business of our farm house: the olive oil, jams and vegetables production, combined to the bed and breakfast activity Le Terre di Isa. It was born in 2016 and its first extravergine organic olive oil was completed in october 2017. That campaign wasn’t so rich because of the adverse weather conditions, but we got our first extravergine organic olive oil (certificated by CCPB - italian monitored operator number LP64 - Supervisor agency authorized by MiPAAFT - IT BIO 006), and we called it “Noi”. This new oil, with its name, tells another story, that one of all people we met as we started this adventure and that helped us to plow the land, to take care of the trees and to harvest the olives, as well as to make us comfortable here in an unknown contest. From that october 2017 we’ve been keeping studying and staying abreast of the matter, so the olive trees, at the farm house’s bottom (cultivar leccino) are growing healthy and strong: the campaign of 2018 got the triple of the production (available in 0,50l bottles in our agriturismo). 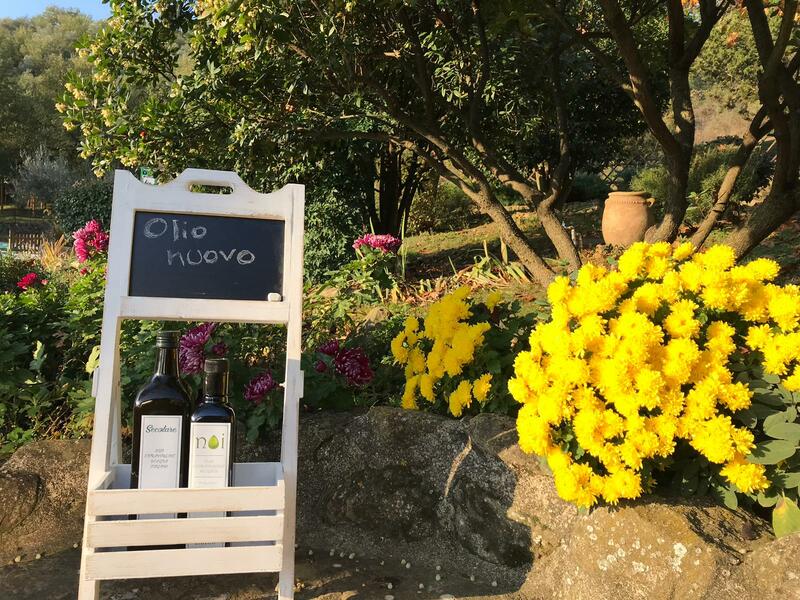 In the meantime, we expanded and we bought another land in Collesanto (near Magione), with centuries-old plants (cultivar “dolce agogia”) in conversion to organic farming (it’s available in 1l bottles in our agriturismo). We didn’t get the awards, but we were really glad to share a beautiful experience with people working for long time on umbrian territory, taking part to a common project to add value and keep identity of umbrian history. Coming to know the origin of the products we daily consume is certainly a priority for everybody. Through our work, we’d like to offer a product, necessary in every kind of house, with a certified quality and assured during all its production phases: growth, harvest, transformation and bottling. We’re taking care of it so that it could be you olive oil as well. We’re working to put back in order all the fruit trees, from which we get jams (apple, plum, fig, cherry) to offer during breakfast to our guest in agriturismo, with homemade cakes and bread and various local products. Work in progress is to realize an organic vegetable garden and a henhouse. We’ll inform you about Elaion’s news...stay tuned!